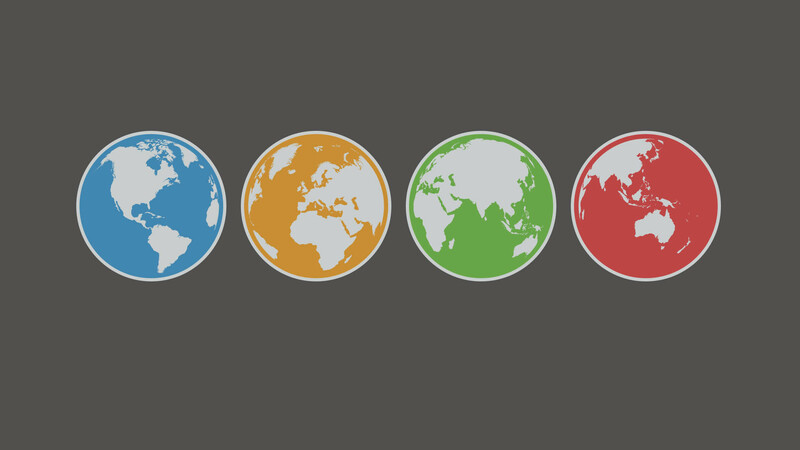 Things change fast in the world of digital, and it’s already been three months since we published our Digital in 2017 series of reports in partnership with Hootsuite, so it’s high time for one of our global ‘Statshot’ updates. Global Internet Users: more than 3.8 billion people around the world use the internet today, up 38 million since January 2017. This 1% increase takes global internet penetration to 51% – in other words, people who don’t use the internet are increasingly in the minority. These latest figures show slightly slower growth than we saw during 2016, but that’s more likely due to slower reporting* than it is to an actual slowdown in user growth (*see the note at the bottom of this article for further clarification). 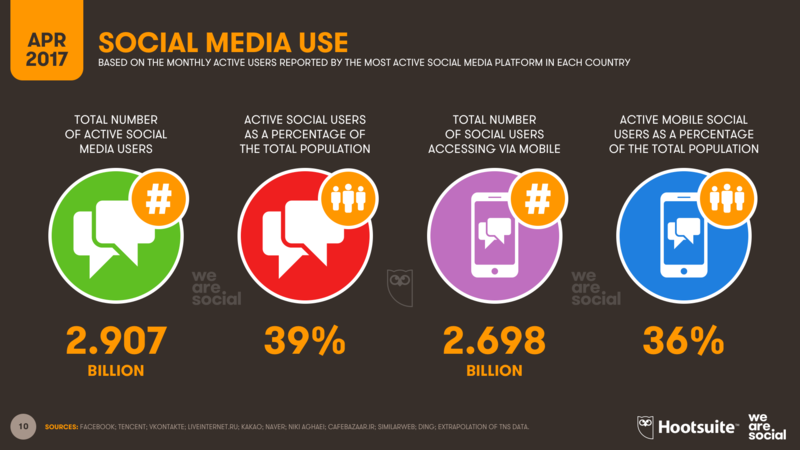 Global Social Media Users: 110 million people started using social media over the past three months, taking the global total to more than 2.9 billion users. This means that social media users are still increasing at a rate of more than 1 million per day – that’s 14 new users every second. 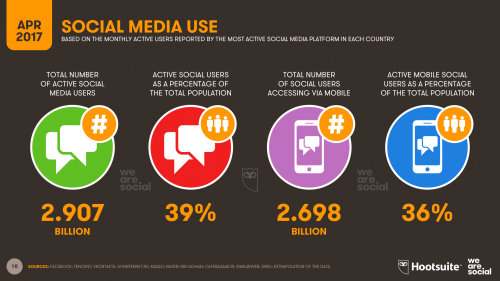 Quarterly growth of 4% is also a sign that social media continues to gain momentum around the world, and I expect we’ll see global social media penetration reach 40% by the time we publish our next quarterly Statshot. Global Mobile Users: GSMA Intelligence have reported an additional 43 million new unique mobile users around the world since our January report, representing growth of 1% during the past 3 months. 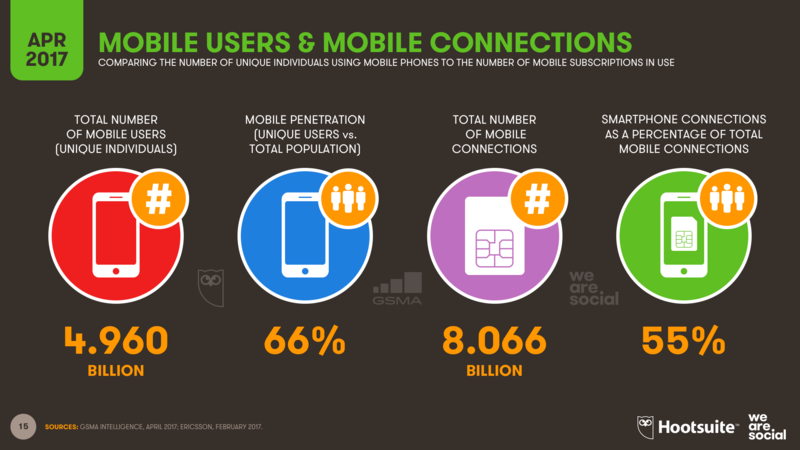 The total number of unique mobile users now stands at 4.96 billion, and we’re edging closer and closer to the magical 5 billion number. The use of a mobile phone is now ‘normal’ around the world too, with almost two-thirds of the entire global population now using a mobile on a regular basis. More and more of these users now own a smartphone too, and the latest data suggest that more than half of the world’s population now uses one of these powerful devices. Mobile Internet Users: the rapid spread of smartphones has led to significant growth in the number of mobile internet users in recent months too, with the number of people around the world accessing the internet via mobile reaching almost 3.4 billion by early April 2017. 93% of all internet users now go online via mobile devices (phones or tablets), and with the majority of new internet users now ‘phone first’, mobile’s share is likely to increase even more over the coming months. 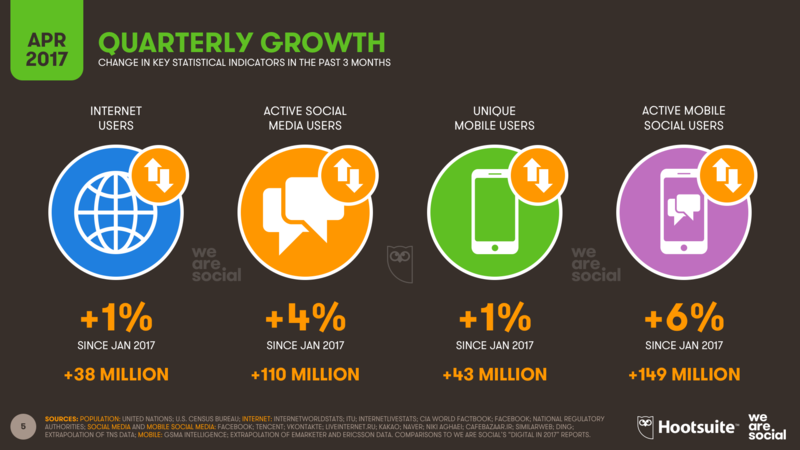 Mobile Social Media Users: as we’ve seen in every one of our reports over the past few years, mobile social media continues to see the fastest growth across all our key data points. 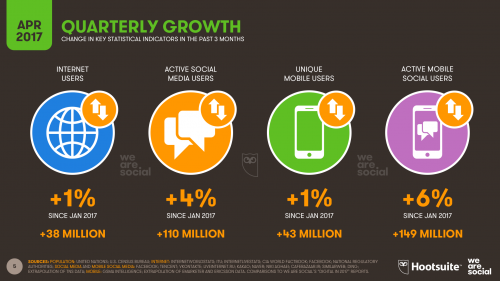 Mobile social media users grew by 149 million in the past 3 months – that’s up 6% in the past 3 months alone, with roughly 50 million new users per month, or more than 1.6 million new users every day. 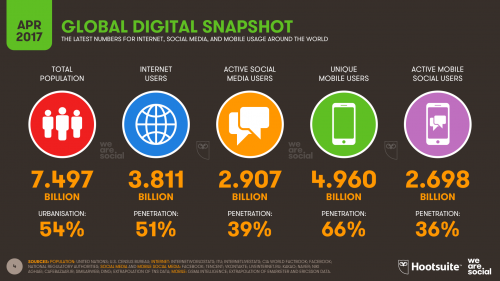 The total number of people around the world accessing social media via mobile devices now stands at just under 2.7 billion, representing global penetration of 36%. The dominance of mobile internet use holds up when we compare the volume of activity, too. The latest data from Statcounter show that mobile phones account for more than 51% of all browser-based web traffic in April 2017, and that doesn’t even take into account internet access through other kinds of mobile apps. Meanwhile, the share of web activity from laptops and desktops dropped almost 20% over the past 12 months, and now sits at just 43%. Tablets’ share dropped a little too, but my hypothesis is that – because this figure shows share – this is more likely due to the increased use of smartphones, and not because of a meaningful change in tablet use. 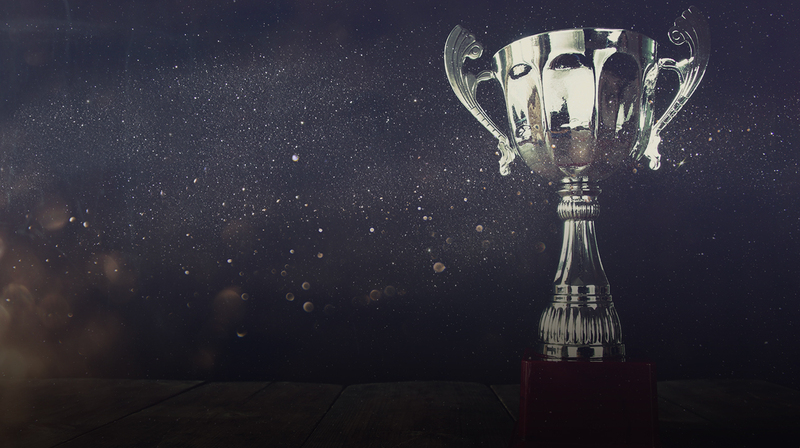 The past three months has brought about a number of changes in the social media landscape too, with a number of the world’s most active social platforms changing position in our rankings. As we predicted in our analysis of our January numbers, the most notable change is WeChat’s continuing rise, and Tencent’s social ‘super app’ has now overtaken QQ to become China’s most active social platform. WeChat’s 5th position in the global rankings is even more impressive when you consider that more than 90% of the platform’s users are in China. WhatsApp’s recent announcement of 200 million new users is another standout story from the past few months, with the world’s most popular messenger now reporting 1.2 billion monthly active users. However, it’s likely that WhatsApp’s stablemate, Facebook Messenger – which hasn’t published updated user numbers in the past nine months – isn’t too far behind. 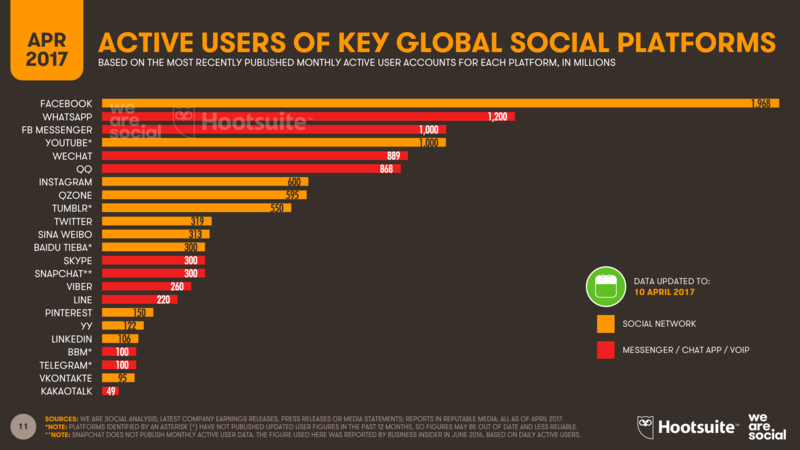 It’s worth noting that Twitter remains in the global top 10, despite the regular bashing the platform seems to receive in the media. However, Sina Weibo – China’s most popular microblogging service – now has almost as many monthly active users as Twitter (313 million, vs. Twitter’s 319 million), and Weibo may well seize 10th position in our rankings by the time we publish our next report. The latest numbers for Viber bring the platform back up the rankings too, with Michael Shmilov, Viber’s COO, telling Techcrunch that the platform now has more than a quarter of a billion monthly active users around the world. 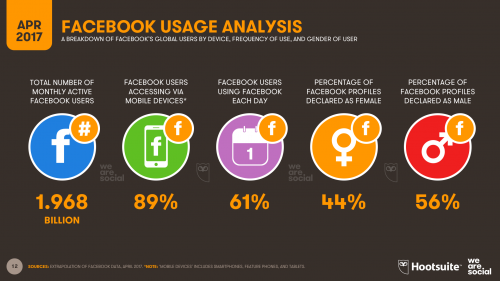 However, Facebook continues to dominate the social world, and the latest data suggest that the world’s favourite social platform added an extra 97 million users over the past 3 months – that’s more than a million new users every day. 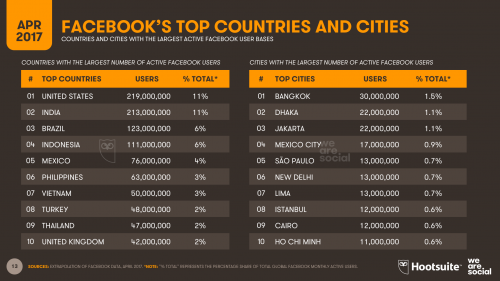 Much of that growth came from India, where 22 million people joined Facebook in the past 3 months alone. What’s more, with almost 250,000 new users in the country every day, there’s a good chance that India will overtake the US to become Facebook’s most active market within the next two months. By that time, Facebook should be very close to passing the staggering 2 billion global MAU milestone too. Bangkok consolidated its position as Facebook’s most active city, with roughly 30 million people in Thailand’s capital using the platform in the past 30 days. However, Thailand still hasn’t reclaimed the title of ‘world’s most social country’, which it recently lost to The Philippines. Data from GlobalWebIndex shows that the average Filipino still spends more time each day on social media than the average Thai social media user, and the Philippines added 3 million new Facebook users in the past 3 months, compared to 1 million new users in Thailand in the same period. Facebook has managed to increase the number of people using its platform each day by a considerable amount in the past 3 months, with daily user number up 600 basis points since January – that’s a relative increase of more than 10%. More than 60% of the platform’s active user base now uses the platform every day, up from 55% in January. The number of mobile users has also increased, with almost 9 in every 10 Facebook users accessing via mobile in the past month. There hasn’t been any change to the platform’s gender imbalance though, and the number of male profiles still exceeds female profiles by a relative 23%. However, there may be more to this stat than meets the eye, as I explored in this recent article on Facebook users’ misrepresentation of their age and gender. The increased use of mobile social media may be contributing to the steady increase in monthly mobile data consumption around the world. 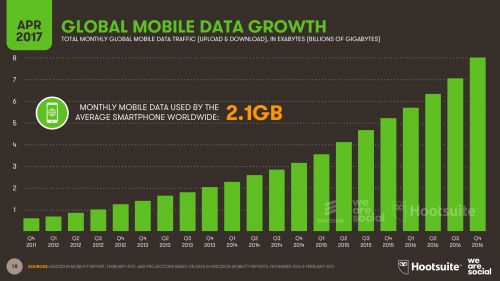 Total monthly mobile data traffic exceeded 8 exabytes in Q4 2016 – that’s 8 billion gigabytes every month, or 3,000GB every second. What’s more, the latest data from Ericsson suggest that the average global smartphone user now uses more than 2GB of mobile data every month, with video accounting for the lion’s share of this bandwidth. As I noted in my analysis of our annual report back in January, these numbers all support the fact that connected media and devices are now an integral part of daily life for most people around the world. In particular, smartphones have brought connectivity to more than half of the world’s population, so it’s time for businesses, NGOs, and governments everywhere to stop thinking of digital, social, and mobile as ‘new’ or ‘emerging’ media. The connected internet experience isn’t the same everywhere though, and it’s important for global organisations to consider how their online offerings will come to life in Los Angeles vs. Lagos, and in London vs. Lahore. It’s also worth highlighting that the majority of the world’s ‘unconnected’ are probably children, who will come online in due course as a part of ‘growing up’. For reference, more than 20% of today’s global population is under the age of 12, with 10% aged 5 or below. Making connectivity more accessible to these younger children – through a combination of cheaper devices and data, as well as more ‘sheltered’ online environments – will help bring education, healthcare, and a global perspective to young people all across the world, helping to accelerate improvements in standards of living and offer new avenues to escape poverty throughout the developing world. If you’d like a more granular look at digital connectivity for every country in the world, you may want to check out the 3,000+ charts in our recent Digital in 2017 series. *note: it’s often difficult to collect and report accurate and up-to-date internet user numbers, because the internet is not a single entity, nor is it managed by a commercial organisation with a vested interest in maintaining the latest numbers. As a result, it’s often up to governments or NGOs to collect user numbers, and – given the complexity of gathering this data – the information may not be available until several months after the data were collected. Internet user numbers are often collected using sample-based surveys too, which can sometimes give a distorted picture of actual usage. For these reasons, we use a variety of different sources to inform the global total we report here, but our hypothesis is that there are likely even more internet users around the world than these numbers suggest. 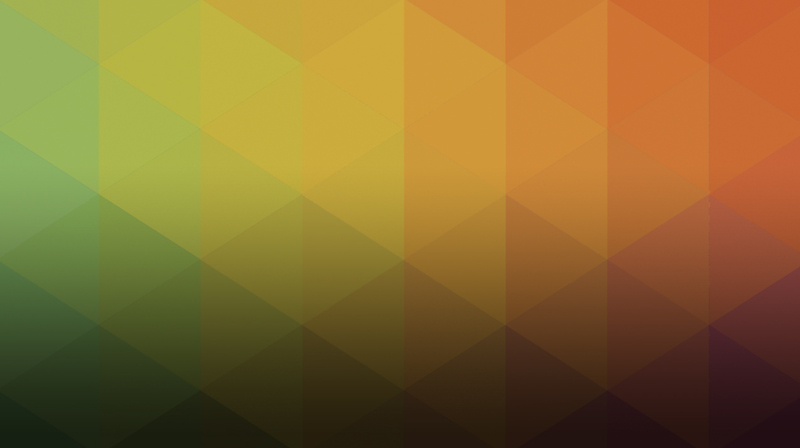 Facebook announces privacy-focused updates, Pinterest becomes a shopping destination - and more. The latest social media news in our Monday Mashup. Facebook tests 'Watch Video Together' feature, Disney creates stickers for WhatsApp - and more. The latest social media news in our Monday Mashup. YouTube teams up with Eventbrite to sell live performance tickets, Facebook cracks down on low quality ads - and more. The latest social media news in our Monday Mashup.